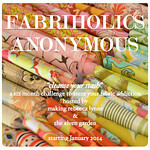 Sunshine Through the Rain: Sewing fear number two ... conquered! After successfully conquering my fear of sewing curves earlier this year, it was time to face the next challenge: making a structured purse/handbag. I have made a few tote bags in my time, but I wanted a bag with some more details, a different shape, and most importantly a zippered closure. Enter the Penelope Purse from Clover and Violet! I had seen this pattern being reviewed on Instagram recently, and I'd also read a few blog entries about other Clover and Violet bags, and how great the patterns were. Most importantly for me I could use the interfacing and fusible fleece that I had on hand (as I can't buy anything like that here and have to get it from overseas). The final push came when a friend, who was leaving to return to America, said casually that she really needed a new purse. I knew I had to make one for her! I just love the end result, and I was so reluctant to give this away in the end! 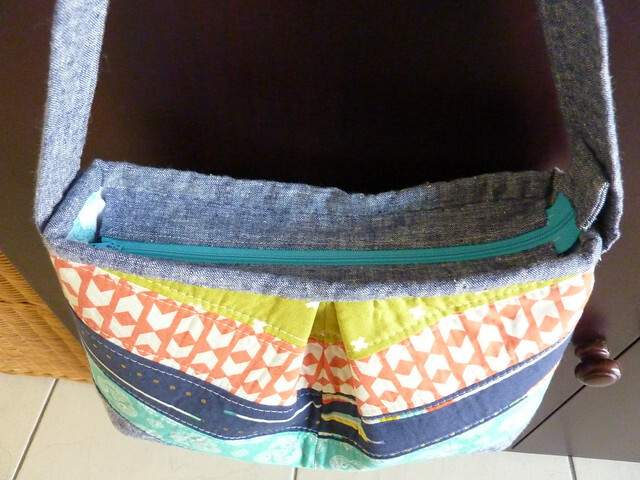 It wasn't a quick make, but the instructions were really clear and even the zipper came together without any trouble! Because I was a bit pushed for time in the end I didn't include the inside zippered pocket, but there is still a pocket which will fit a phone. The bag is very roomy inside, and it fits snuggly under your arm, nice and secure. Now I just need to make another one for me! 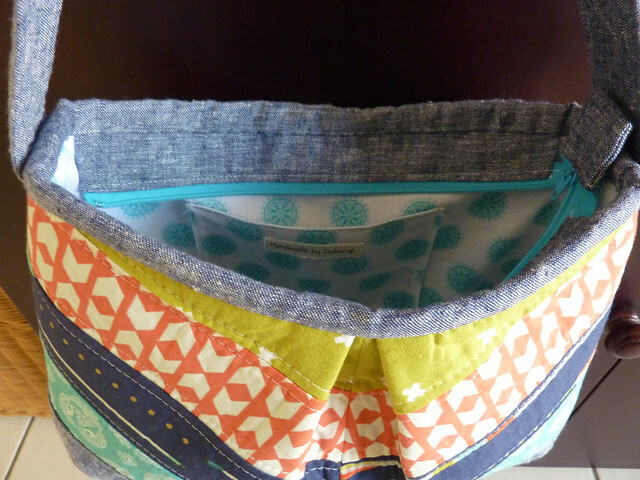 How awesome to be conquering your fears and making such beautiful and useful items to boot! I really like the look of the size of the bag. Nicely done! How nice that you made a last minute gift for your friend to cherish long after her visit is over. It's looks lovely and I might have to try one! Great job conquering fears! It's the best way to grow in any aspect of your life. It would be hard to give that beautiful purse up; you're a great friend! Definitely make one for yourself - its gorgeous!! 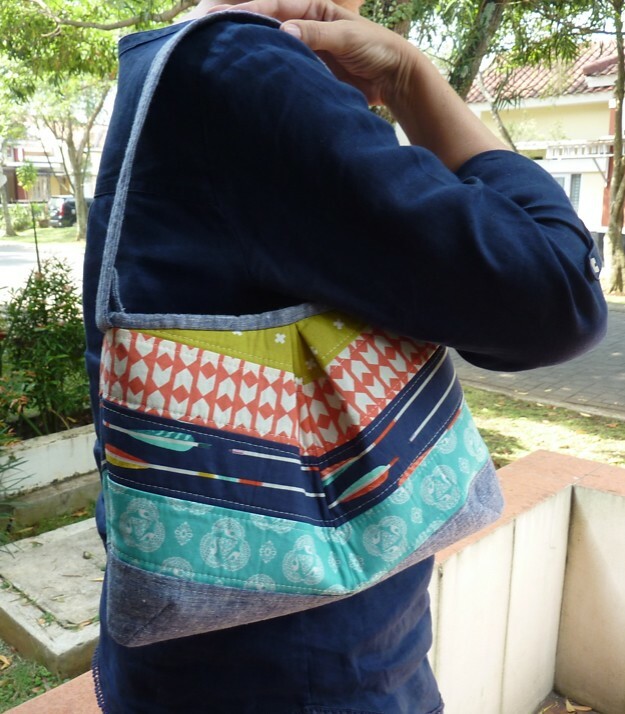 And what a stylish way to conquer the fear of bag making! You definitely need to make one for yourself! I love the bright zip! it's a lovely bag! Well done on tackling something new, so successfully! Go you! Well done for conquering fears and making gorgeous goodies! it looks fantastic! Well done, I still have a fear of tricky bags like this so i'm extra impressed by the job you've done with this one. I look forward to seeing the bag you make yourself too. 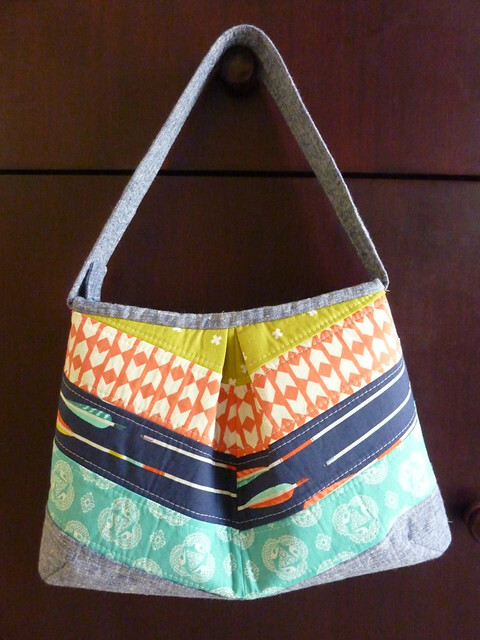 Love this cute bag and you did such a lovely job with those curves! A very lovely bag! Now you really need to make one for yourself. Isn't it wonderful when you can make something you are really proud of without having to go to the shops for supplies! Gorgeous bag, I've bought this pattern and will be making it as soon as I'm home.